Earlier in July, SparkFun announced the introduction of a new service to push Internet of Things device data, data.sparkfun.com. Esentially, data.sparkfun.com is a data channel where data can be pushed (easily via HTTP posts) to a persistent repository on the Internet. So your Internet of Things devices are able to send data to a single repository. SparkFun wants to provide a “robust service for use with all your projects”. Like anything in life, although well put together, there are some reasonable limitation on the free service. Each project that you register (referred to as a stream) has a limit of 50MBs of data. Once the 50 MBs is exceeded, older data is deleted as newer data is received. Additionally, 100 pushes to the stream are allowed over a 15 minute period, which allows you to either push data in bursts or distribute them as is appropriate for your particular needs. Also, all streams are publicly accessible to anyone with the correct URL. That being said, the service utilizes Phant, an open source engine developed by SparkFun that is freely downloadable in the case where you want to run the servers on your own (cloud) hardware. If you run the service locally, you can configure the installation to allow for arbitrary storage scenarios and are not limited to 50Mbs. In less than an hour, I was able to setup a custom stream to record the running history of my Internet controlled stoplight that indicates the quality of our software build at work. Using a simple HTTP POST, approximately every 30 seconds I log the data to my data.sparkfun.com stream and the allow reporting via Google Charts. All I can say is absolutely amazing! However minor, the power USB port has been moved to the side of the board next to the HDMI connector, which is nice to no longer have cables necessary on one side of the board. Two addition mounting holes are provided which makes mounting the board in enclosures a bit easier. The SD card has been replaced with a micro SD card that protrudes much less from the bottom side of the board. And possibly one of the best improvements of the model B+, especially where batteries are used to power the board, is the reduction in power required for the model B+ (reduced power consumption by between 0.5W and 1W). 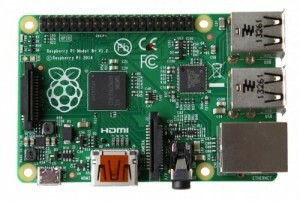 The Raspberry Pi Foundation plans to continue production of both the Raspberry Pi model B and B+, both of which are available for purchase for $35. Outside of commercial use the Pi, where specific hardware enclosures have been fabricated for the model B, the model B+ will be the more popular model moving forward. At Redpoint, we’ve been fortunate to be trusted by so many of our clients to do their high-profile mobile and enterprise web development. Historically, the majority of our mobile development has been using native approaches on the iOS, Android and Blackberry platforms. However, more and more of our clients are interested in using a hybrid mobile development approach. Hybrid development is technique where a mix of native and web technologies are used together to deliver a native app shell (i.e. container) that provides some or most of the user interface using traditional web technologies (e.g. HTML5/CSS3). Although not true in all hybrid development, in our development at Redpoint, we always have data and web content delivered from web/application servers, over the Internet, to the mobile device. The attraction of the hybrid approach is based on the desire to create mobile apps faster and cheaper with existing web development staff. The good – What are the positive aspects of hybrid mobile development? It is possible to develop certain apps more quickly and get to market faster. We’ve found that larger applications, and especially those that are used to display information to the users (and not gather much input), are great candidates for hybrid development. These types of apps allow for the right economies of scale and provide the acceleration required to override the drag/complexity of dealing with both native and web technologies on one project. A significant portion of the web technology implementation can be shared across multiple web platforms. This eases the development across multiple platforms, but still requires some native development on each native device. This ensures each implementation, on a given mobile platform, feels native and works as the user would expect on the given platform. The bad – What are the negative aspects of hybrid mobile development? More technologies (both native and web technologies) are involved in the project, so it is harder to staff. We’ve found that hybrid projects require specialized skills for short durations. This type of staffing requirement does not usually fit well into enterprise IT departments because of the diversity of skills required and short and sometimes fragmented needs for different skills. Does not allow the same level of control over the user interface (UI) and therefore the UI is not “as tight” as with native approaches. Hybrid UIs are not as smooth or snappy as native code. Potential poor runtime performance, especially on older phones on apps that are graphic/animation heavy. Using a native approach for animation is generally faster at runtime and less error prone than using hybrid approaches. May take longer to develop and test using a hybrid approach for apps that are small. Small apps are not necessarily faster to develop and test when you introduce the additional complexities of a hybrid ecosystem. The ugly – What is not widely known and might be surprising about hybrid mobile development? Although appropriate in many situations, choosing a hybrid development approach over a native approach introduces significant risk to a development project. A native app has its features mapped against a native platform’s capabilities and is therefore considered relatively straightforward and does not typically experience implementations that don’t work as expected. Using hybrid techniques, your team will undoubtedly encounter technical hurdles and gotchas that are unexpected. If you have experienced team members that are well versed in both web and native technologies, you may be able to recover without much blood, sweat and tears. However, if you have an inexperienced team, you may find some of the issues significantly effect your delivery schedule and budget. Although we’ve successfully incorporated hybrid technologies into many apps for clients, careful analysis must be performed to evaluate whether it is appropriate. In cases where it is appropriate, it is critical to understand where to use a hybrid approach and where to use native technologies. For example, we’ve found that navigation-related UI elements are best implemented natively so they are responsive. On the other hand, portions of the page that are displaying read-only information are great candidates for hybrid containers for which content is streamed from web servers. What is everybody learning about hybrid development? Make sure you have experienced team members on your hybrid mobile team and think carefully about where to use/not use a hybrid approach. Each app is different, so don’t get hung up on only what’s been done in the past and be creative with your native/hybrid boundaries. This will better guarantee your project benefits from the use of hybrid development in order to get done faster, cheaper and on more mobile platforms. Hybrid development certainly has it place, and when harnessed appropriately, is a welcomed architectural approach.